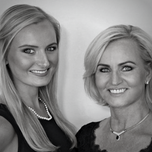 We're a mother and daughter real estate team and we love what we do. We strive to make the home-buying and selling process seamless and fun for every one of our amazing clients. As rewarding as our work is, it's also important for us give back to our local and global communities in a way that is meaningful and personal. We're so excited to be working with Home for a Home to support and build houses for those in need, because we believe home is the most important place in the world.